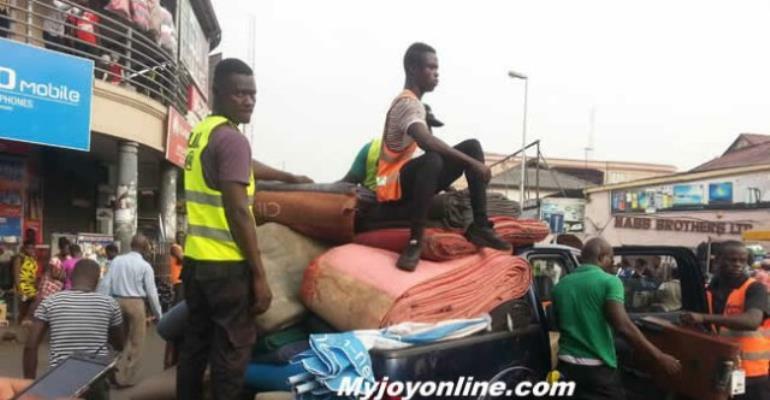 The Accra Metropolitan Assembly (AMA) has claimed that ongoing efforts to decongest the city and prevent trading activities on the streets, has reduced waste collection from the Central Business District by 30 percent. The exercise, according to the Gilbert Ankrah, Public Relations Officer of the Assembly, has also reduced the cost of collection and resources used. According to Mr. Ankrah, the assembly is now collecting a third of what it used to collect before the exercise began on January 8, 2018. He made the remarks in an interaction with journalists after presenting 300 waste bins to 15 public senior high schools in the metropolis to kick start waste segregation programme for Senior High Schools (SHS). He said the assembly, as part of efforts to actualise the clean city agenda, and make the vision of President Akufo-Addo to make Accra the cleanest a reality, had adopted a four-pronged approach, which focuses on education, enforcement, provision of infrastructure and equipment, and operational strategy. "We were using two compaction trucks for the King Tackie Tawiah statue area through 31st December to the Motor Transport and Traffic Department (MTTD), and the Railways area to the Rawlings Park area but now only one truck is used, on the same stretch...This means that waste generated on that stretch has also reduced by half ," he added. He said the volumes collected around the Adjaben area from Farisco to NIB, has also reduced by five tonnes compared to the initial volume of ten tonnes on the same stretch adding that traders who sell along the pavements contributed largely to the waste generated in the city. "The intense trading activities on the City's streets lead to congestion and consequently waste generation that create filth...If we have over three thousand people selling on the streets illegally, with each of them generating about 0.74kg of waste , you can imagine the quantity of waste to be generated daily," he stressed. He indicated that the AMA has outsourced waste management and waste collection to private companies and urged residents to look out for these companies and register with them. "Jekora Ventures and Asadu Royal Waste Company Limited have been assigned to Osu Klottey and Ablekuma North, respectively while Liberty Waste is responsible for the waste in Dansoman. "The Okaikoi South area, Ayawaso West, and the Abossey Okai enclave have all been assigned to J Stan Owusu and Zoom Domestic Services Limited," he said adding that Alliance Waste is expected to collect waste arond the Nima and Abeka areas." Mr. Ankrah announced that the assembly would soon roll out a programme to streamline and regulate the activities of motorised tricycles in the collection of waste in the city.